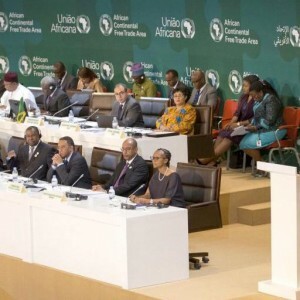 The impressive turnout at the African Union’s Extraordinary Summit on the African Continental Free Trade Area (AfCFTA) on 21 March showed the continent’s united fervour to boost its economic opportunities. Delegations from 50 countries, including 27 heads of state, attended the summit in Kigali. The fact that there were almost as many leaders present as attend the bi-annual AU summits contrasts with the major divisions within the AU on much-needed reforms of the institution. Countries seem to agree on boosting intra-African trade, but disagree on strengthening the AU itself. At the January AU summit, 23 countries signed up to the Single African Air Transport Market and 30 have signed the AU’s Protocol to the Treaty Establishing the African Economic Community on Free Movement of Persons, Right of Residence and Right of Establishment. Even though many hurdles lie ahead in establishing the free trade area and even more in allowing free movement of Africans across the continent, these agreements are important first steps. The AfCFTA initiative in particular has been hailed as a major achievement, paving the way for greater intra-African trade and more economic opportunities for all African states. However while 44 countries signed the agreement, two of Africa’s biggest economies, South Africa and Nigeria, didn’t. Due to their economic, military and diplomatic strength and their history of driving change in Africa, these two countries are crucial for such initiatives. South African President Cyril Ramaphosa did attend the Kigali summit, and made upbeat statements about the benefits of the AfCFTA. South Africa did sign the Kigali Declaration – showing its intent to sign the free trade deal in future, pending finalisation of outstanding aspects of the agreement. South Africa in fact proposed the drawing up of such a declaration, says the country’s Minister of Trade and Industry Rob Davies. Ratification of the AfCFTA would also need the nod from South Africa’s Parliament. Nigeria’s President Muhammadu Buhari decided at the last moment not to attend the summit, citing the need for further consultation. According to local reports, concerns were raised by private-sector organisations such as the Manufacturers Association of Nigeria. This came as a blow to Rwanda, the event’s host, and its President Paul Kagame, current AU chairperson. Nigeria has a major role to play in Africa’s free trade deal. In fact, Buhari leads a country that has historically been at the forefront of getting the AfCFTA off the ground. The creation of such a free trade area was first mooted in the Lagos Plan of Action that followed a summit in Nigeria’s commercial capital in 1980. The 1991 Abuja Treaty on establishing the African Economic Community was the forerunner of the AfCFTA and trade experts often still refer to the process as the Abuja road map. Nigeria initially proposed to host the secretariat of the AfCFTA. The country is also the undisputed leader of the 15-member Economic Community of West African States (ECOWAS) – one of Africa’s most pro-active regional economic communities. Within the AU, Buhari has also been appointed the lead head of state on the AU theme for 2018 – winning the fight against corruption: a sustainable path to Africa’s transformation. So why did Nigeria stay away? While the only official explanation has so far been that the decision was put on hold ‘for further consultation with local stakeholders’, it is also clear that some Nigerians might not see intra-African trade in the same way as, say, South Africans do. Nigerians have in the past been on the receiving end of South Africa’s strong economic drive on the continent – the cellphone giant MTN being one obvious example. This was also one of the reasons given for strong opposition in Nigeria to Morocco’s application to join ECOWAS at the end of 2017. Morocco is one of the biggest investors on the continent, especially in West Africa – and there have been fears that greater access via ECOWAS agreements on free movement of people and goods could threaten local businesses in Nigeria. However Nigeria is also a major exporter and investor on the continent in financial services, manufactured goods, agricultural products and the like. Trade experts concur that in the long run, the AfCFTA can be a win-win for all, especially the bigger economies. Former United Nations Economic Commission for Africa head Carlos Lopes commented during the summit that Nigeria would come around on the trade agreement – although he later tweeted that it had missed a symbol of historic significance by not signing. Clearly the two giants of sub-Saharan Africa, Nigeria and South Africa, both have a lot to gain from greater intra-African trade. In the past, strong cooperation between South Africa and Nigeria has led to major advances, such as the transformation of the Organisation of African Unity into the AU. In his new book on Nigerian and South African foreign policy, The Eagle and the Springbok, University of Johannesburg Professor Adekeye Adebajo calls South Africa and Nigeria the two ‘Gullivers’ in their respective regions. After a ‘lost decade’ where ‘Africa’s indispensable bilateral relationship’ between South Africa and Nigeria was marked by competition and diplomatic squabbles, there is a need for greater cooperation between these African powers, together with others such as Algeria, Ethiopia or Angola, he says. ‘The combined political clout of these two states represents a potentially formidable force in shaping Africa’s integration and representing the continent’s interests on the world stage,’ he says. The AfCFTA and other AU initiatives need both South Africa and Nigeria. Ramaphosa has so far indicated that he is committed to regional integration and intra-African trade. Now is a good time to strengthen diplomatic links with Nigeria to keep the Abuja road map on track.